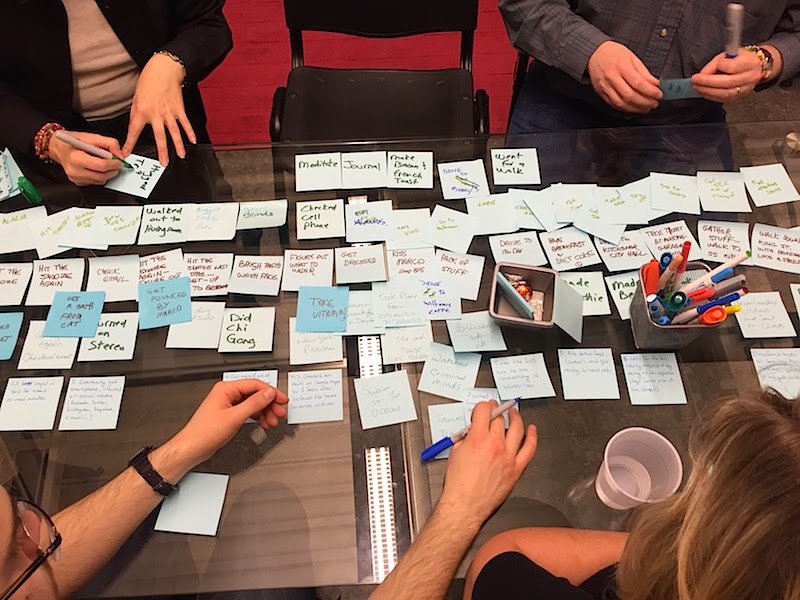 Last Friday I visited the REAP Felt Lab to provide an introduction to user story mapping in a lunch-hour workshop. I’ve been a big fan of story mapping ever since I was introduced to it in a workshop by Jeff Patton back in 2008, and I was delighted when he finally released a definitive book on the topic last year. I highly recommend User Story Mapping: Discover the Whole Story, Build the Right Product to anyone who wants to learn more about this powerful technique that can help product development teams focus on users and their needs rather than on features. The introduction that I delivered comes straight from Patton’s book, and the folks at Felt Lab were thoroughly engaged by the experience. It was a full house, and each team learned a lot during the surprisingly challenging exercise of creating a story map about their morning routines. Unsurprisingly, the same engagement and enlightenment were visible during a similar uxWaterloo session back in March. If you missed these events, keep an eye on the schedule for The Boltmade Sessions, as there’s a good chance that we’ll deliver another iteration of the workshop there.